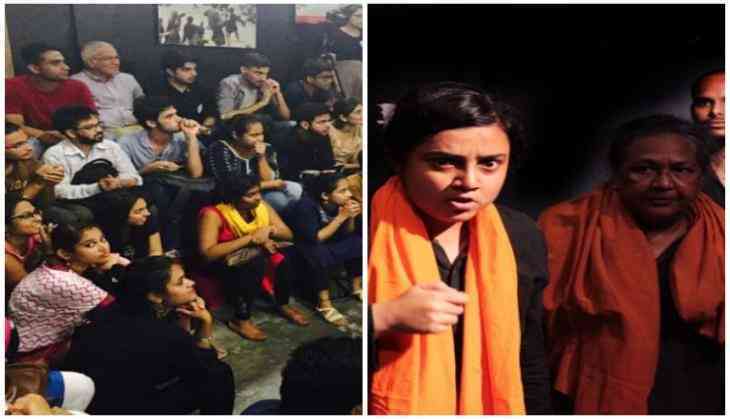 'The Roots- a performing arts society' recently organised a short play theatre festival at Studio Safdar, Delhi, giving young artists an opportunity to experiment with their creativity. The event witnessed performances from Delhi University theatre circuit, amateur theatre groups and mono-act performers, followed by a discussion with ' Pink' actor Sudhanva Deshpande. The performers shared the stage with Jana Natya Manch, Delhi's oldest street play theatre group, whose was the closing performance of the evening. The season one of 'short play festival' on Friday observed a heavy rush of audience who were present at the event to enjoy experimental insights and crisp depictions of performances and hence, the studio space was full packed. In an exclusive interview with ANI, ' Jana Natya Manch' actor and director, Sudhanva Deshpande stated, "I am delighted that the short play festival is happening here at Studio Safdar because there is a lot of theatre activity in the city and not enough opportunities for young people to showcase some of their work in progress- experimental work, work that is not entirely finished yet but they would like to show it, share it, showcase it, get responses and so on." "And this festival becomes one of the few platforms that are available for this kind of showcasing and sharing and learning from each other that young theatre people always need," added Deshpande. The event has been scheduled for two days, 28 July and 29, hosting seven teams each day. Talking about the aim behind this event, Prabhjot Singh, art curator, The Roots said, "I feel that from rehearsals to performance there is no room for the artists to experiment with their creation and therefore, an event like short play festival is important to create a space for the theatre artists to experiment and explore the dimensions of a theatrical production." Studio Safdar is an independent and non-funded space for arts and was established in 2012. May Day Bookstore and cafe equipped with leftword books is also a part of this artistic space.